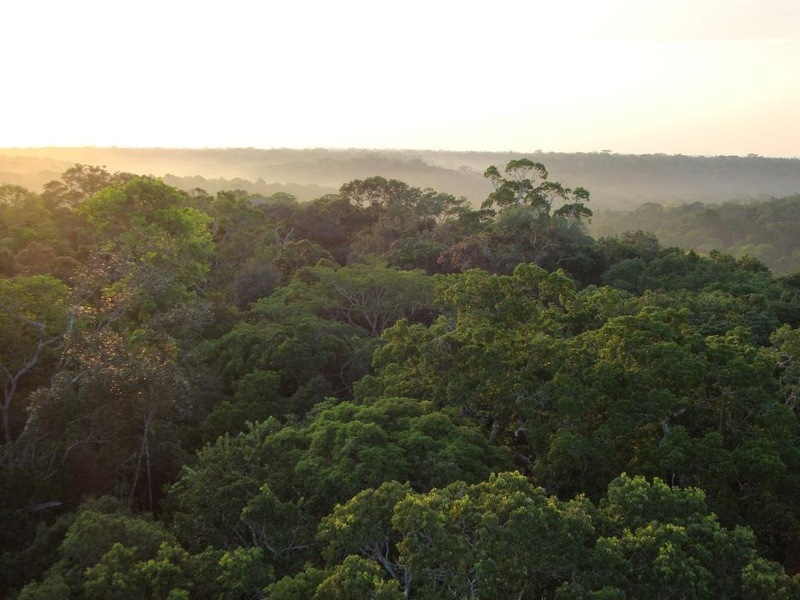 Feature Image: Sunrise over Brazilian Amazon rainforest near Manaus. Photo from author’s personal archive. As you wander inside a healthy forest, it is clear that there is more to it than just a group of trees. Most people would point out that beyond the trees are a variety of animals, possibly birds singing, a rabbit hopping and insects flying, such as butterflies and mosquitoes. However, most people probably do not think about the small and hidden animals that are crucial for growth in these types of environments. Forests, especially rainforests, depend on very busy termites and ants for decomposing organic matter and returning nutrients to the system. When thinking of termites, you might assume them enemies of trees, since their major source of food comes from their wood. However, termites not only decompose wood and leaves (specifically, cellulose), but they also transport water to drier layers of the soil, which promotes better conditions for their colonies and for plants to establish in these more arid areas. With these capabilities in mind, Dr. Louise A. Ashton and collaborators aimed to answer how the relationship between tropical rainforests and termites could affect plant communities during drought periods. The authors monitored intact, established termite colonies (i.e., control plots) and suppressed the activity of others (i.e., suppression plots) in old-growth tropical rainforests in Borneo/Malaysia during and after the 2015-2016 El Niño drought period. Colony suppression was carried out by physically removing part of the mounds and through poisonous baits. These suppression methods resulted in ~45% reduction in the termites’ feeding activity. It is dry, but termites are busy at work! In control plots, termite abundance was more than double the amount observed during post-drought conditions, which led to higher leaf litter decomposition rates, soil nutrient variety, and soil moisture. In comparison to suppression plots, these control plots had 41% higher leaf decomposition rates, especially under drought conditions. Leaf litter depth (i.e., the amount of plant matter that accumulates in the soil surface) was 22% higher in suppression plots during the drought because of reduced decomposition rates. These results are especially interesting because most studies attribute leaf turnover to be a result of microorganism activity, and not termites. This study shows that termites are not only major forest matter decomposers, but also accelerate this process during dry periods when decomposition is usually lower than in wetter seasons. Hence, these results indicate that termites are an important component of the global carbon cycle. The consumption of tree biomass by healthy and thriving termite colonies recycles the carbon stored in plant material and reduces the amount that could escape the system as heat trapping greenhouse gases. All plots had lower moisture levels during the drought. However, during these conditions, control plots had 36% more moisture at 5-cm soil depth (i.e., shallowest soil layer) than the suppression plots. Similarly, soil nutrient variety was higher in control plots during the drought than in suppression plots and in post-drought conditions. Considering these remarkable findings, the researchers further tested if the observed higher soil moisture and nutrient conditions would positively affect seedling survival rates. Indeed, they found that there was a 51% increase in seedling survival rates in control plots during the drought in comparison to suppression plots and post-drought. These results are strong evidence that high termite activity favors the establishment and growth of tropical plants and alleviates the drought effects on mature plants, promoting a more resilient forest. This is especially great news since there is a large expectation that tropical tree mortality will exponentially increase with climate change. The authors acknowledge that it is currently unknown which mechanisms influence the increase or decrease of termite activity during drought periods. However, shedding light on the positive role these little creatures have on tropical forest health and resiliency gives hope towards the battle in conserving the valuable biodiversity these forests contain. Not only are tropical forests highly vulnerable to climate change, but they are also threatened by rapid increases in deforestation rates. Consequently, the higher the rate of deforestation, the quicker the reduction of termite colonies. If rainforest disturbance is not contained, there is not much that these tiny climate change warriors can do to help preserve these critically important habitats.